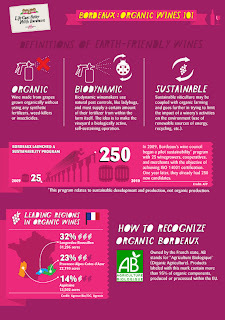 Curious about Bordeaux wine? The two infographics here are worth checking out. Click on each to get a larger, easier-to-read version. 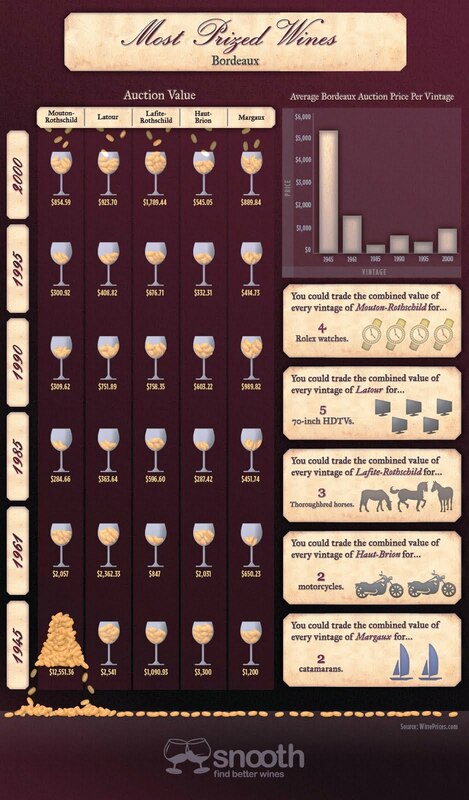 The top infographic, "Most Prized Wines," was compiled by Snooth. 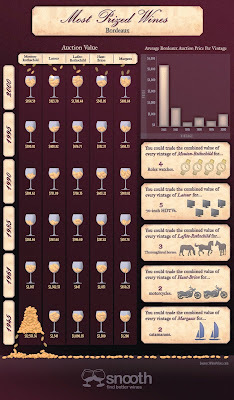 It shows per-bottle auction value for various vintages of the top five Bordeaux wines (Mouton-Rothschild, Latour, Lafite-Rothschild, Haut-Brion, and Margaux). At $284.66, the 1985 Mouton-Rotschild is the bargain bottle in the bunch. The most expensive, at $12,551.36, is also a Mouton-Rotschild (1945). According to the Anniversary Vintage Chart, which sums up good/bad years for Bordeaux vintages, 1985 was a "lovely year in Bordeaux, Port & Champagne, top Burgundy still good." On the other hand, 1945 is described as a "fabulous vintage. Candidate for 'vintage of the century', including Port." From lovely to fabulous is worth about $12,300! My only quibble with the Snooth graphic is the cutesy way they tell you what various combinations of value could buy you in real-world goods. It would work much better if they gave specifications for those goods. They say, for example, that you can "trade the combined value of every vintage of Lafite-Rothschild for 3 thoroughbred horses." When I visited EquineNow, the value of a thoroughbred ranged from $650 to $12,000. And if you're talking about a top-of-the-line thoroughbred such as Secretariat, the value is in the mega-millions. So that's basically a useless comparison. 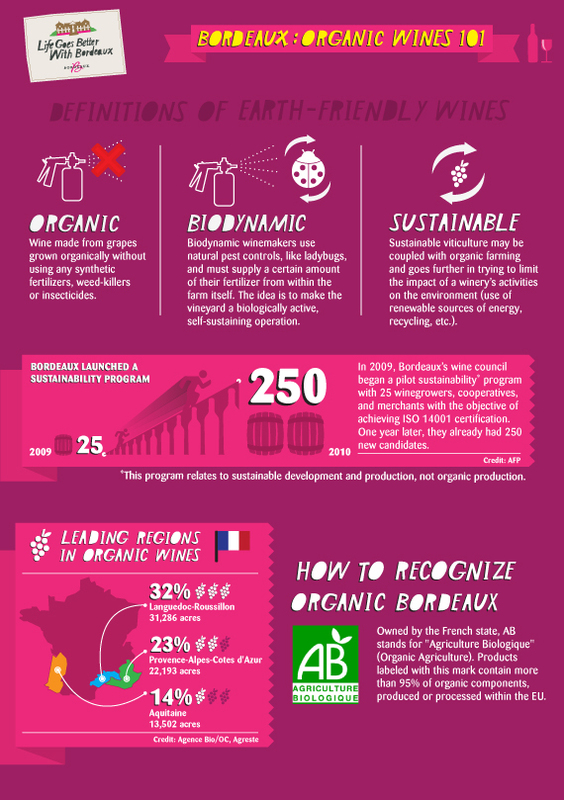 I like this infographic from EnjoyBordeaux because it gives a nice overview of Bordeaux's organic, biodynamic and sustainable winemaking. Suzie Rodriguez writes about food, wine, travel and other subjects from her base in Sonoma, California. Click this link to search for travel books and gear! Picture Window theme. Theme images by gaffera. Powered by Blogger.